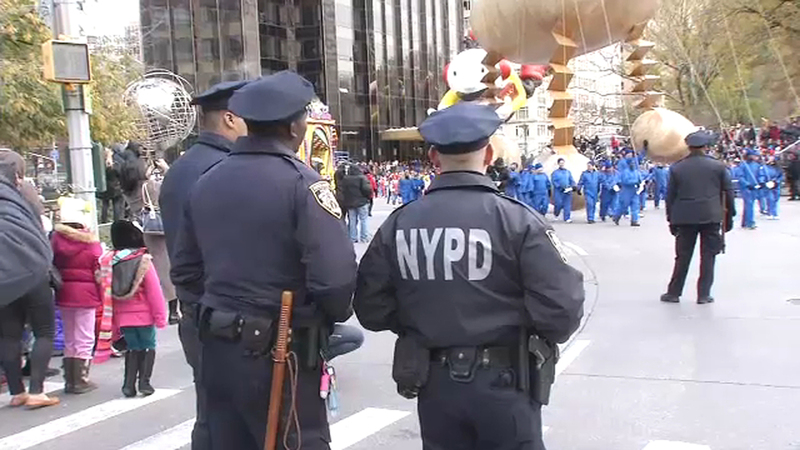 NEW YORK (WABC) -- The NYPD ramped up security for the Macy's Thanksgiving Day Parade as police went all-out to secure it in a year marked by attacks on outdoor gathering spots. Officers with assault weapons and portable radiation detectors were among the crowds, along with sharpshooters on rooftops and sand-filled city sanitation trucks poised as imposing barriers to traffic at every cross street. 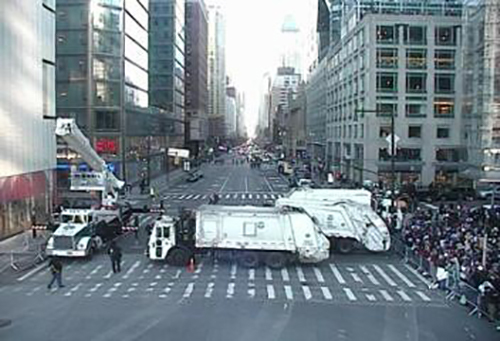 81 blocker trucks were in place at cross streets along the 2.6-mile parade route. The trucks weight 16 tons apiece. Filled with sand, they weigh up to twice as much. "Every year the NYPD has done more to keep this event tonight and the parade itself safer," Democratic Mayor Bill de Blasio told crowds gathered to watch the balloons being inflated Wednesday. "Because we understand we are dealing with a very challenging world. And so the amount of resources and personnel we put in has increased each year to make us safer." Authorities say there was no confirmation of a credible threat to the parade, but it came after a truck attack on a bike path near the World Trade Center killed eight people in October. Weeks earlier, a gunman in a 32nd-floor Las Vegas hotel room rained bullets on a crowd at a country music festival, killing 58 and injuring hundreds. Mayor de Blasio and the NYPD repeatedly stressed that layers of security, along with hundreds of officers, would be in place for the parade and that visitors shouldn't be deterred. But they asked spectators to be alert for anything suspicious. Police Commissioner James O'Neill said the security preparations began the day after last year's parade. "We have the blocker vehicles in place, thousands of uniformed officers out here. It's going to be a real safe route, so everyone should come out and enjoy it," said O'Neill.